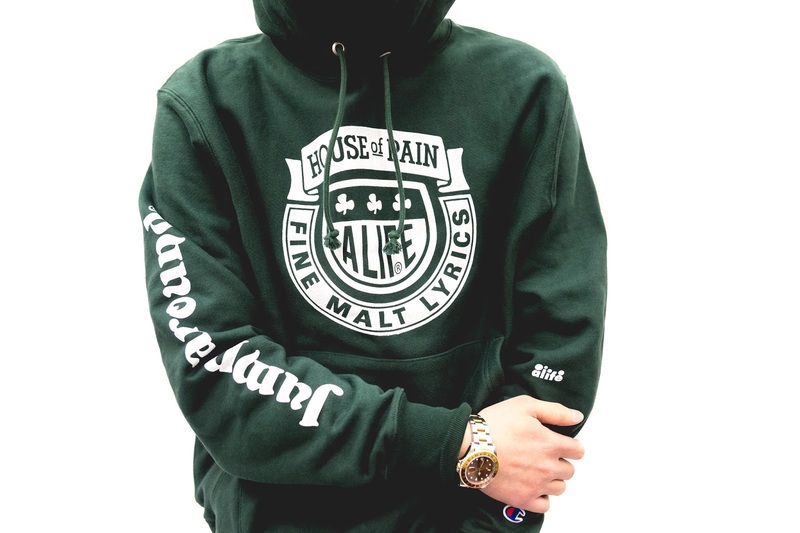 Coinciding with this years St Patrick's Day and celebrating 25 years since the release of 'Jump Around', New York street-wear purveyor and hip-hop aficionados Alife have released the House Of Pain hoodie. All proceeds from the sale go to the Cystic Fibrosis Foundation, an organisation close to House of Pain front man Everlast's heart. Peep this article on The 65 Roses Story and listen to the track from Everlast's album 'Songs Of The Ungrateful Living'. The classic Champion hoodie comes in clover green and incorporates both the Alife logo and the 'Fine Malt Lyrics' logo from the group's debut album. As I type this and less than 24 hours since it's release this is sold out online. You can still grab them in store as far as I am aware. Though you may be sore to have missed out, it's a great situation for the charity and all families that benefit from their continued research and support. Something that will cheer you up is revisiting the House Of Slaine mixtape and blasting it all day. Happy St Patrick's Day to everyone.